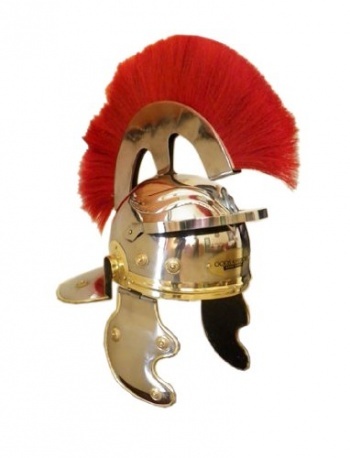 Have you always wanted a Roman centurion's helmet? Well, then, perhaps you should consider the new Collector's Edition of Gods & Heroes: Rome Rising. The regular version of Gods & Heroes: Rome Rising is already out in stores, but the Collector's Editions are coming out both tomorrow and in a month. Fans of Ancient Rome may want to hold out for the Collector's Helmet Edition the game, since that version will ship with a genuine replica of a Roman centurion's helmet. According to Amazon, this helmet is "fully wearable" and weighs a total of six pounds. Accordingly, it'll have "a pronounced red plume and is made of heavy gauge high carbon steel complete with brass accents and fittings." Currently, Amazon has the version of the game listed at $219.99, and it's due out on July 21st. However, if this seems like your sort of deal, then you should probably pre-order the game soon. Amazon only has 200 of the helmeted editions in supply.